Valuable new services from a single supplier have recently been brought to market to enable users in the oil pipeline sector to increase their flexibility and benefit from cost advantages. Before these new services came the Parflange system developed by Parker, which continuously flares and then flanges the tube during its cold-forming procedure. Since its introduction, it has proved highly effective with regard to mechanical strength and long working life. Furthermore, this method is 9 to 12 times faster than comparable welding. On top of this, cleaning the tube before and after the manufacturing process is not necessary. The Parflange process is always environmentally friendly since no dangerous gases occur, like they do with welding and brazing, and heating up before the manufacturing process is also not necessary. It was from this technology that the Parflange F37 system was developed, enabling tubing systems of various sizes to be connected to each other. It uses the orbital tube forming technology for tubes from 16 to 273mm outside diameter and is intended for wall thicknesses up to 9mm and pressure ratings up to 420 bar. For connections in which no pre-formed tube can be assembled, the F37 retaining ring system is available. Here the flange is held on the tube by a retaining ring that, together with a high-tech seal carrier, ensures leak-free connections. 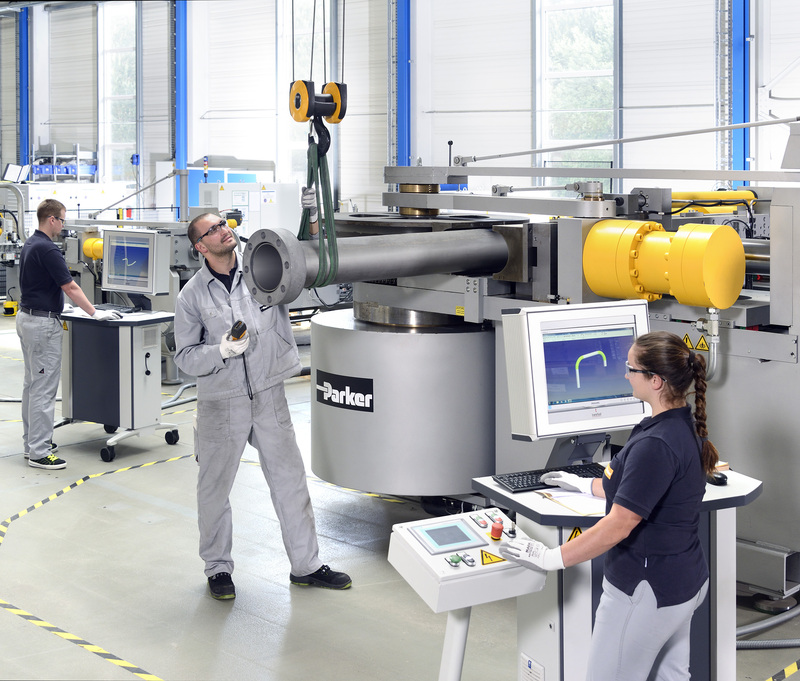 The Parflange F37 system offers distinct advantages compared with classical welding; the preparation time per tube-end is shorter and the not inconsiderable costs for cleaning the tube and checking after welding are quite simply not required. Also, the tube connections show constantly high quality and accuracy. As a result, installation times are shorter and the project time overall is also shorter as well. Parker has developed its Complete Piping Solutions (CPS) system around this technology. It has been put together from several modules such as consultation, piping layout, pre-assembly, delivery and installation, from which the customer can put together his tailor-made concept for the manufacture of piping systems or, when required, can make use of all the above-named services. Now, the concept is being extended with two additional modules. Parker Onsite Containers were developed, amongst others, for service in the offshore and shipbuilding sectors. They contain all the assembly machines that are required for preparing the assembly of tubes from 6 to 60mm diameter. If required, much bigger tubes with outside diameters up to 273mm can also be prepared. The range of high-precision machines covers all the fittings and connectors supplied by Parker, such as high-performance flanges and the EO-2 soft-sealing fittings system. Common to all of them are the consistently good assembly results. 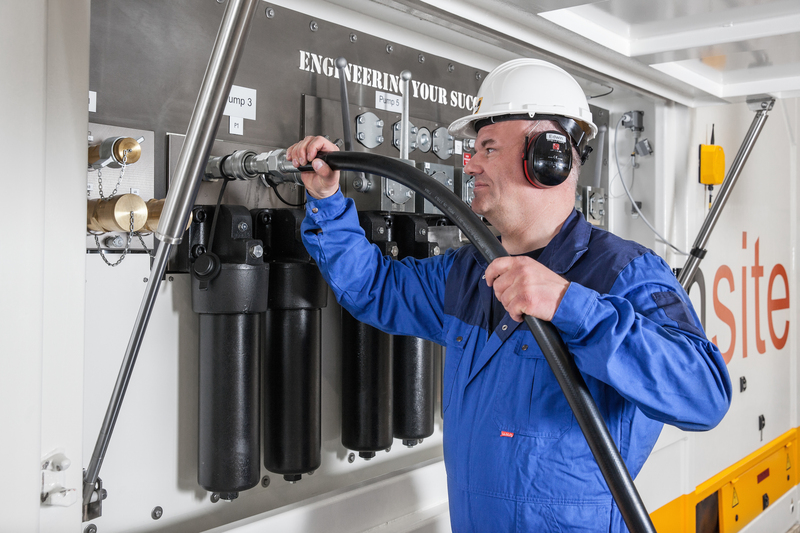 Furthermore, Onsite Service Containers include complete equipment for the installation of tube lines, such as forming, bending, cutting and cleaning machines. The contents of the container can be made up according to need and actual requirements on site. In addition to this, the CPS programme has been extended to include Parker hot oil flushing units. They clean the tubing system before they are connected to the main consumer. By system flushing increase the safety of the complete hydraulic system and contribute to a reduction in maintenance costs and down time. Hot oil flushing units can also be used on existing hydraulic systems. The flushing units can clean tubelines with turbulent flow an outside diameter of up to 273mm. The wash medium is mineral hydraulic oil and the adjustable flow capacity of 3,000 l/min can be increased with additional units if required. With total of 12 filters on the pressure and return line, the provided oil is clean from the start - which makes cleaning very effective. All of this is monitored by Parker’s ICount system. The flushing units are certified to Lloyds 20ft DNV 2.7-1 for offshore application and tested for pressures up to 630 bar. The cleanliness of the flushed tube systems is documented when the work has been completed. When required, Parker can also make an on-site service technician available. The onsite container and hot oil-flushing units are very interesting from a business point of view. As well as being purchased, both systems can be leased, allowing the user to save high acquisition costs. The tubelines produced by these high-precision machines are of a consistently high accuracy so that expensive tasks such as reworking on site are greatly reduced. Thoroughly flushed tube systems ultimately increase the safety and constantly reliable functioning of the total system. Wanja Galewsky and Ramiz Selimbasic are with Parker Hannifin.